Validation is important. While self-belief gets us up in the morning, physical acknowledgment keeps one foot in front of the other. In the case of Cincinnati, Ohio-based The Tillers, it was the coins and burritos they received in exchange for the songs they played on banjos, guitars, and an upright bass. For the members of The Tillers, their string band music was filtered through punk rock and a decade into a career, the recent self-titled release showcases a musical diversity honed in ten years of playing as a band. The Tillers tackles tales of family, history, travel, and politics. 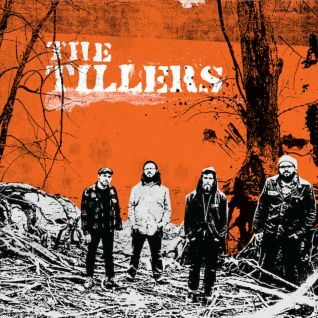 For the fifth studio album The Tillers entered Candyland Studios in Dayton, Kentucky with Mike Montgomery (Jeremy Pinnell, The Breeders) as producers, recording the album live to 2” tape. 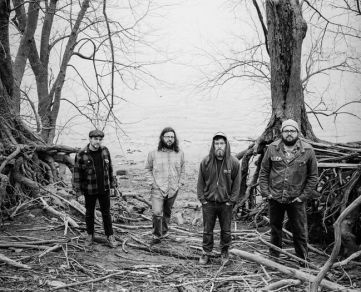 Walking paths far from their Ohio home, The Tillers open the album in South East England, sending an audio post-dated postcard to “The Weald and the Wild”. Addressing man’s levelling of the land, The Tillers direct an apology to our earth in “Dear Mother” and beckon ‘come on children get your heads out of the clouds’, encouraging a tech generation to lock arms and walk together down “Revolution Row”. Songwriter Sean Geil (guitar/vocals) feels The Tillers is ‘definitely more aggressive than past efforts. At our core we are still a traditionally rooted string band, but I’d say our punk rock roots are more visible on this album’. Mike Oberst, Aaron Geil, and Joe Macheret back Sean’s words as the band present a united mood and melody setting limits in “Like a Hole in My Head” and drawing lines in Woody Guthrie’s “All You Facists Bound to Lose”. The Tillers sing the plight of worldwide workers seeking work in “Migrant’s Lament”, put a powerful current in the rhythm of “Riverboat Dishwashing Song”, watch small town life go up in smoke for “The Old General Store is Burning Down”, and quietly close the album door exiting on coming home tenderness of “Another Postcard”.